Nintendo really wants me to pick up a 3DS. 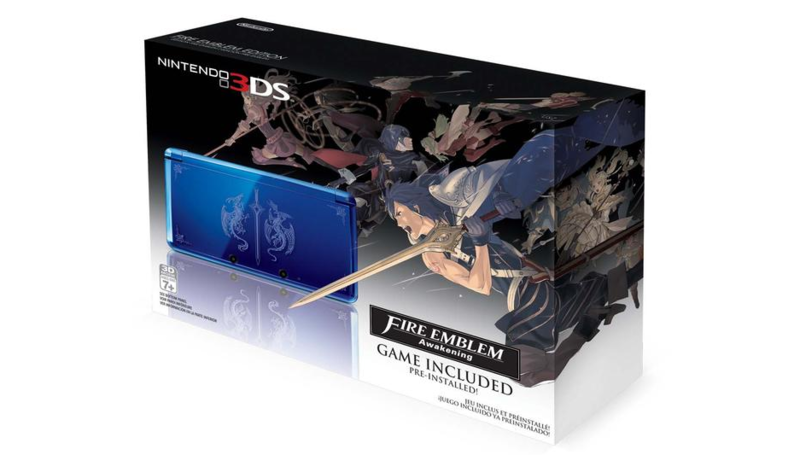 If you haven’t been following the Big N on Twitter, they announced just recently that there will be a special edition 3DS coming out when Fire Emblem: Awakening releases in just a few weeks! How they tempt me so. If this picture is to be believed, the 3DS will come in a blue shell with a design on the top that looks to be two dragons around a sword. Because the 3DS can download full games now, you will not be getting a physical copy of the game, but instead it’ll be preloaded and ready to go when you open the box. That’ll be great until you accidentally drop the thing in the toilet. Look for Fire Emblem: Awakening to hit shelves February 4th. This bundle will be there too for $199.99. Is there any word on where I could pre-order this, or is it still a bit to early for that? I actually don’t know. I haven’t heard anything about pre-orders for the bundle. Then I will continue to keep my eyes and ears peeled. The game and this bundle come out on the 4th, so you should be seeing/hearing things soon enough.